As I have increasingly become a predominantly wine drinker, I find co-fermenting grapes with a beer, or even blending wine with a sour to be quite tempting. Lambic brewery, Cantillon, has been adding grapes to two of its seasonal brews for years and one of them, Vigneronne, was a favorite of mine when their products were more readily available in Portland. Sour beers and grapes can be joined to create a unique beer in a variety of ways, including co-fermenting the grapes with the beer, adding grape juice to the fermenting beer, or adding a portion of finished wine to a completed brew. My favorite Portland brewery, Upright, has been releasing a number of grape-incorporating bottles recently, and I purchased two of those to taste. The 2017 Oregon Native uses estate pinot noir grapes from the Patton Valley Vineyards to co-ferment in Upright barrels. Intriguingly, the beer was fermented with yeast indigenous to the Patton Valley orchard, which introduces a natural wine touch to this creation. I poured the beer in a Cantillon glass and it boasted a translucent, Burgundy red color in the light. With a very pleasant aroma and what I would be inclined to call a classic Upright nose at this point, it had mild brettanomyces character and oak. My bottle was quite tart by Upright standards, with notes of lemon, cassis, slight bitterness, and some residual sweetness accompanied by light tannins from the oak and grapes, consistent with the use of the leaner pinot noir. It was a dry (but not bone-dry) beer with medium carbonation ditton on the mouthfeel. Going Gris takes another step on the road of blending the philosophies of natural wine making and wild ales. This collaboration between Upright and natural wine experimenters Minimus Wines was made for the 10th anniversary of Bailey’s Taproom and features orchard yeast, a blend of beers (including one with rose petal), and the rare savagnin rose grape matured in an acacia wood cask. The beer looked extraordinarily clear and Pilsner-like, with a rapidly declining head. I observed spice and grain on the nose with a whiff of brett. It was tart, vinous, and herbal, with a pronounced bitter-lemon like note, and quite carbonated. The light mouthfeel gave this elegant and very drinkable beer a sophisticated and cerebral touch. I had high hopes for these two beers and was not disappointed. Both brews were excellent but Going Gris was particularly fascinating. An obvious question is whether these grape / sour blends are more than the sum of their parts. I think it depends. I had another wine / sour blend by the glass at Upright which did taste more or less like beer blended with wine, mutually diluting each other’s likable characteristics. Other attempts, such as the Cantillon brews and the Upright bottles reviewed here do something more and open a world that cannot be fully captured with wine or beer alone. As this beer style is a subset of an already smaller craft style it will probably still take a considerable amount of time to understand the behavior and outcomes of using different kinds of grapes, fermentation choices, and aging regimes to identify the most attractive combinations and styles. These experimental brews do indicate this will be a fruitful journey. The title of this post is somewhat tongue-in-cheek because if the growing interest of wine drinkers and restaurants in white skin-contact wines is any indication, “orange wines” do not need much of a defense. As it often goes, however, some observers and detractors of this phenomenon do not confine themselves to stating that it is just not their thing, but rather present a number arguments as to why they believe the rise of white skin-contact wines is just “a fad.” As a general rule, skeptics of orange wines are skeptics of natural wines in general. To them, the rise of natural wines and orange wines will always be a niche thing – confined to stubborn traditional winemakers and urban hipsters. As someone who has written extensively on spontaneously fermented beers and “wild ales,” I have seen such denigrating statements before. It may be undeniable that many of the earlier adopters of spontaneously fermented beers, wild ciders, and natural wines are “hipsters,” but to characterize a return to local and ancient fermentation methods as “a fad” is odd, to say the least. One typical argument is that many white skin-contact wines are flawed. The word “flawed” should be used with caution, and is only meaningful when one can establish what the “normal” wine characteristics for an orange wine should be. It makes little sense to judge a skin contact wine by the standards of a “normal” white wine. Saying that an orange wine is too phenolic, bretty, or oxidized begs the question. If these characteristics are traditional for the style, and work well in a skin contact wine, than they are neither flaws nor faults. To use an analogy from the beer world again, the presence of lacto bacteria and brettanomyces is a flaw in a lager, but a defining characteristic for a lambic beer. A wine style has to fail on its own terms to be flawed. If a wine turns to vinegar, or the proliferation of wild yeast deprives the wine of all fruit and complexity, it is reasonable to conclude that it is a failure. But if you are really trying to break down some of the arguments against orange wines (and natural wines in general), a lot them can just be re-stated as not conforming to the criteria of a clean (white) wine. The duration of skin contact also matters a great deal. A crisp orange wine that was on the skins for only 24 hours is a completely different animal from an orange wine that was on the skins for 12 months and then buried in amphorae for fermentation and aging. This makes it challenging to even generate a set of standards or expectations for all orange wines. Sampling a lot of different skin contact wines, and then revisiting the occasional modern white wine, has left me puzzled. Following wine writers such as Alice Feiring, it is not perplexing to me that we ferment white wines on the skin, but rather, that we stopped doing so. There is a time and place for clean, transparent, and sparkling whites but that such wines have almost become the norm needs explanation. I suspect that the explanation is the same as for other alcoholic beverages. We want a clean, consistent, fruit-forward product that has alcohol but does not feature the diverse and lively products of actual fermentation, and no signs of tartness, “wild” yeast, or oxidation, in particular. Our palates have increasingly been shaped by alcoholic beverages that were literally “killed” before bottling. When conventional winemakers talk of terroir they often confine themselves to the soil, not the microorganisms involved in fermentation. The yeast comes from a package. Of course, the strongest argument in favor of a “new” (i.e. old) style is that it is good. The reason why I started writing about spontaneous fermentation is, once more, that I was simply blown away by the flavors, aromas, and visual appearance of some of the white skin-contact wines that I (serendipitously) tried. It was this “aha” moment that I also experienced when I drank my first lambic beer and became a strong public advocate for them. In a world where natural wine bars and shops proliferate, “sour” beers and spontaneously fermented meads and ciders are on the rise, and kombucha starts replacing soda habits, I am not that concerned about the struggle of orange wine for recognition. But some historical / conceptual clarification is needed to counter some of the ignorant reception of these wines. There may be a day when spontaneously fermented skin-contact wines will be on the decline again, but don’t count on it any time soon. Lindemans is not the kind of brewer that I had expected to review any time soon on this website. Despite its respectable history as a lambic brewer, Lindemans has been mostly known for its production of sweetened lambics and taking shortcuts in brewing (oak chips instead of real barrel fermentation). As a results of the rapidly growing interest in traditional lambic in Belgium and wild ales in the United States, Lindemans has been increasing its production of traditional lambics in the form of year-round tradional geuze and kriek bottlings, and occasional special brews and collaborations. SpontanBasil is a collaboration between Lindemans and Mikkeler from Copenhagen, Denmark. Despite being a limited release, I have seen SpontanBasil in local grocery stores since 2016. While some lambics and wild ales sell for prices comparable to a good wine, I suspect that the almost $30 price tag did not make this beer fly off the shelves, despite its “ridiculously limited quantities.” Or at least, not in Portland. I got a lot more interested when a local store in my neighborhood decided to start offloading this beer by a substantial price drop. SpontanBasil was made by modifying the traditional geuze process by adding whole basil leaves to a batch of one to two-year old oak-aged lambic. Appropriately so, the green bottle also sports a green label that blends together the vintage art deco logo of Lindemans and the Mikkeler logo for a classic, and somewhat amusing, effect. Even the bottle cap covering the cork is green. As someone who increasingly seems to prefer the addition of herbs instead of fruits to lambic I was quite eager to sample this beer. A pour of SpontanBasil in a Cantillon glass shows a clear golden color. The aroma is that of a classic geuze, oak, and a little bit of mild greens. The flavor is fresh and quite sour with mild tannins and what appears to be the medicinal flavor of basil in the aftertaste. Overall, the beer drinks like a good, classic geuze, with that little extra touch. Since I do not have any other basil lambics or sours to go on I do not have a good idea of how much aroma and flavor one can expect from an experiment like this. I even purchased a little basil (later used for a basil tea) to use as a benchmark. I have tasted a lot of dry-hopped lambics and sours with a wide variety of herbs and I must admit that I had hoped for stronger basil notes. I also wonder about the rate at which the basil aromas and flavor decrease over time. I know Cantillon recommends drinking its fruit lambics at a relatively young age and perhaps something similar applies to botanical brews such as this. Of course, maybe there was simply not enough basil, or the basil should also have been added during the boil itself. Considering its rather weak basil character (at least, to my palate), pairing this beer with basil based dishes (as the distributor recommends) seems like a little bit of a stretch to me. But considering that geuze is my favorite beer style, I was still left with a rather good blend of lambics. It appears that Lindemans has a strong interest in adding botanicals to lambics (‘”Botanische Lambiekbieren'”)because, following Cantillon, they also released a lambic with elderflower named BlossomGeuze and recently announced a new bottling of lambic with Thai ginger named GingerGeuze. In fact, I had made an earlier attempt to characterize wines that should appeal to lambic drinkers (“funky”, “natural”, etc.) but my attempt seemed contrived and retrospectively I feel that only the oxidized, full, whites of the Jura region were a good, first approximation. I thoroughly enjoyed many natural wines but never experienced that transformative, life-changing experience with a particular style of wine making that initially drew me so strongly to lambics – despite finding myself increasingly drinking more wine. In 2017 the Portland Fermentation Society attended a natural wine event at Liner and Elsen where my favorite wine turned out to be an orange wine named “La Petite Robe” by Jean-Yves Peron from France. I purchased a bottle. Things started to solidify. I started deliberately looking for orange wines on menus now (and tried to seek out the places that served them). In June 2017, after an uninspiring day-trip to Florence (“the open air museum”) I returned to Bologna, collected my courage, and found myself a table at the local natural wine bar Olindo Faccioli, expecting a fair amount of language challenges. This did not happen and my inquiry about an orange wine by the glass was met with educated enthusiasm and I was swiftly presented with one of my best wine experiences to date: Denavolo Dinavolino. There was more than a whiff of brettanomyces in this wine, yes, but it complemented its tart profile beautifully! I re-ordered this wine by the glass and at some point the server just handed me the remainder of the bottle…. I think this orange wine experience in Bologna, facing the gorgeous red and orange buildings, triggered the same kind of “eureka” moment that I had experienced in the past with the spontaneously fermented lambics. Which may not be too surprising because I do not think it is contrived to see the shared properties between lambics, the oxidized Jura wines, and the ancient skin-contact wines. Upon returning to the US I made sampling many more skin-contact whites an important priority (Coenobium Rusticum, Gravner, etc.). And after an almost five year hiatus, found my passion to write about spontaneous fermentation rejuvenated and have decided to make skin contact wines an important part of this blog. I realized there are so many stories to tell. So many subtle differences in aroma and taste to explore. What does skin contact mean for different white grapes? Flavor as a function of skin exposure time? Storage vessels such as amphorae and barrels. Understanding how the complex biochemistry of skin-contact fermentation in whites creates such beauty. And with the price of lambic (which remains another passion) reaching absurd, but understandable, levels in the United States, I am glad that this new fascination will not be a complete drain on my wallet. While American craft brewers release wild ales and beers fermented with “brett” around the clock nowadays, brewers who utilize spontaneous fermentation are still a lot rarer. Block 15′s Turbulent Consequence Première Année is a “spontaneously oak barrel fermented ale” that is brewed each fall and spring according to Belgium lambic tradition. That means a turbid mash, unmalted wheat, a long boil, aged hops, and cooling of the wort in a coolship before barrel aging. This bottle is a 2012 selection of two barrels and bottled with honey (!). As such, the beer is an interesting approximation of a Belgian gueuze, albeit a little on the younger side. The beer pours a cloudy, burnt / golden orange; the head disappears quickly after pouring, producing a flat appearance. The aroma is fairly complex. Lactic notes dominate in addition to sweet, lemon, funky, “wet cellar,” and brettanomyces notes. The taste is dry, lemony and puckering. Despite its flat appearance, carbonation is moderate, mouth feel is moderate, and there is some astringency from the barrels. This is a dry, light, and refreshing beer. Despite its low alcohol (5.8%), I would not characterize this as a session beer. It’s quite sour (at least the bottle I had), even for people who enjoy this kind of thing (me). I cannot praise Block 15 highly enough for their ventures into spontaneous fermentation. I’d say that this beer is still a little young and raw and it lacks the complexity and depth of Belgian lambics but spontaneous fermentation and blending is an art that takes many years of experience to perfect. Strangely enough, I would say that this blend could have benefited a little from “something else” (a stronger oak note, botanicals etc.) to take some of the edge of the puckering lacto but that would have made it a different beer. I don’t know if the sweet aroma came from the honey that was added to the bottle, but I do like this natural approach to create carbonation because it adds a little complexity and allows the beer to ferment to dryness. 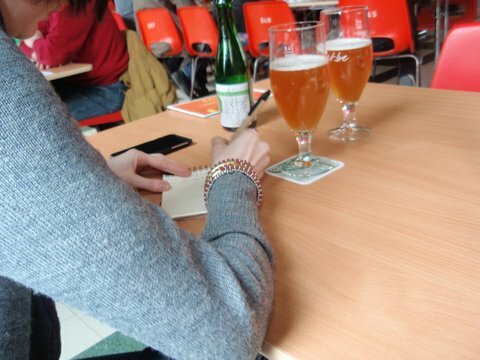 Toer de Geuze, a Belgian beer tour celebrating the regional gueuze beer style, is held in Flanders every two years. This year’s tour was held on April 21, 2013. And while Aschwin has taken the tour a couple of times before with his father Theo, this was my first time to tag along. Since we have been enjoying the style in general and beers from breweries on the tour specifically for at least 5 years now, I am actually quite happy that I was not able to attend earlier. I was able to appreciate the tour that much more, and with considerable knowledge already at my disposal. We attended a music festival in the Netherlands before going on the tour, but since that is not the subject of this review I will start with our arrival in Dworp the evening prior. Aschwin’s father, Theo, met us in Leiden late in the evening and drove us to our lodging – a massive building on a large estate, all of which gave me the impression of it being the home of a wealthy English family. Since we did not want to incur international or roaming charges on Theo’s Dutch mobile phone, Aschwin had written down directions to our destination. Somehow, though it was the dead of night and we used no GPS, we made it to the hotel flawlessly. The next morning did not go as well. Using the same strategy, we quickly became lost and began going in circles. Aschwin and his father argued in Dutch the whole time, occasionally pulling over to accost a pedestrian and inquire for information. Finally, someone was able to guide us to our destination. We pulled into the parking lot and got on the appropriate bus for the route we had chosen. We had decided to take the tour visiting Hannsen’s, 3 Fonteinen, Oud Beersel, Boon, and Tilquin. Everyone on the bus looked pretty happy and excited. The tour guide came over the loud speaker and, thankfully, addressed us in English, the universal language. “Are you awake? Yes? Are you ready to start drinking?” he asked. It was 10:00 am, and time to get the show on the road. Our first stop was Hanssen’s, where we visited from 10:20 – 11:00 am. Hanssen’s is an old brewery housed in a barn and surrounded by farm animals. Our first beer was a “straight” lambic – one which has not been blended – tapped directly from a cask into into our waiting glasses. I was not able to ascertain the age of the brew, unfortunately. It was very straightforward, being quite still (i.e., uncarbonated) and tart, the defining characteristics of a straight lambic. 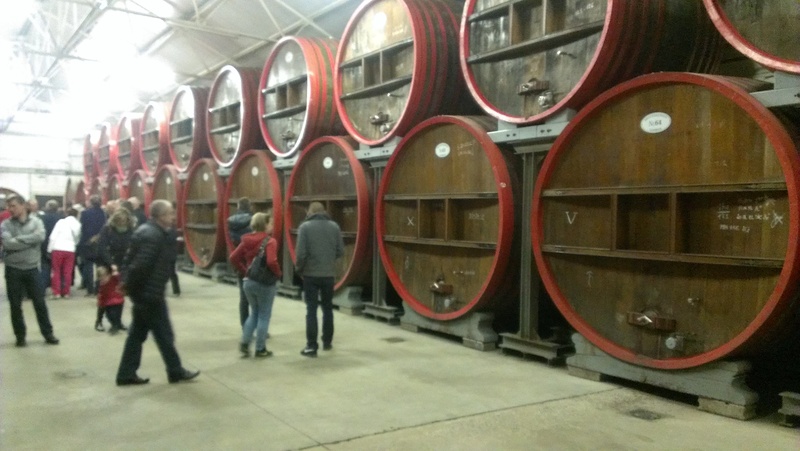 We followed the straight lambic with a gueuze, which we carried with us as we wandered the brewery observing the old machines that are still used to bottle Hannsen’s brews and rows of ancient barrels crusted with the foamy eruptions of the beer fermenting inside. Some newer barrels were in use too, which looked oddly out of place in what was otherwise a display of ancient brewing tradition. Outside, there were a few booths offering edibles. We decided to have some sausage, thinking it wise to put something in our bellies before continuing our long day of alcohol consumption. After quick ride down the highway to the town of Beersel, we were allowed 50 minutes at our next stop, 3 Fonteinen. 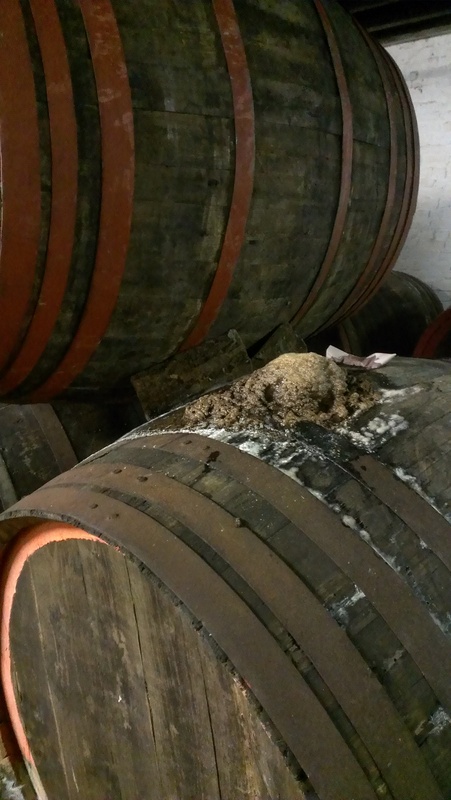 Some of you may have heard about the storage place thermostat disaster at this brewery in 2009 which resulted in the loss of close to 100,000 small bottles of beer. I remember wondering if they would be able to recover from this event. The good news is that they eventually did. An all new brewery, financed entirely by beer sales, enables them to produce more great beer than ever – up to 4,000 liters at a time. I savored a 1 year old straight lambic while I took the English tour and heard about the new equipment and the design of the brewery. 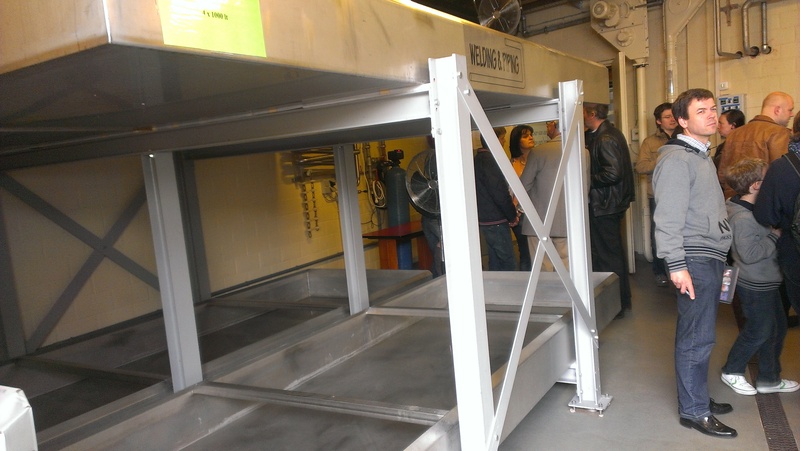 Four enormous 1,000 liter capacity coolships were among the most impressive sights. In the barrel room we also saw washed rind cheeses aging on a rack. At the end of the tour, we saw these cheeses for sale along with 3 Fonteinen beers. A venue across the road was also open and serving beer to accommodate the unusually large number of people visiting the brewery. We stopped in to enjoy an Oude Gueuze before leaving. The crossing guard was happily directing traffic with a beer in his hand. Only in Belgium! 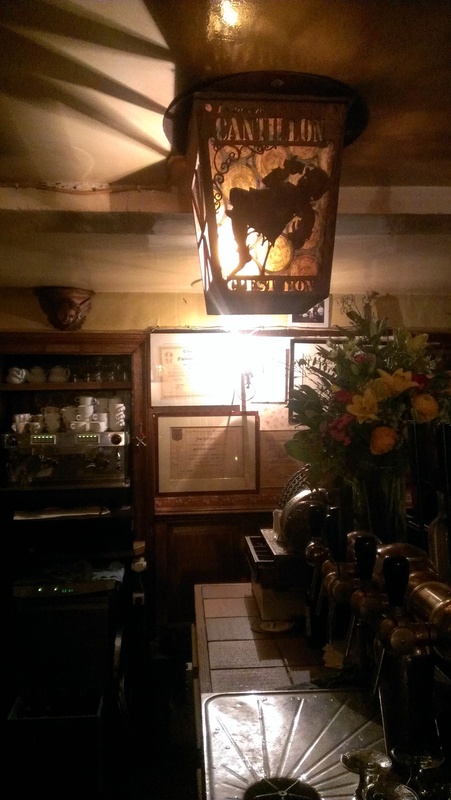 Though Oud Beersel stopped brewing in 1992, they do still produce and sell beer. Here’s how: they give their recipe to another brewery, Boon, which brews the wort. Oud Beersel then obtains the wort from Boon and blends their own gueuze in small batches. 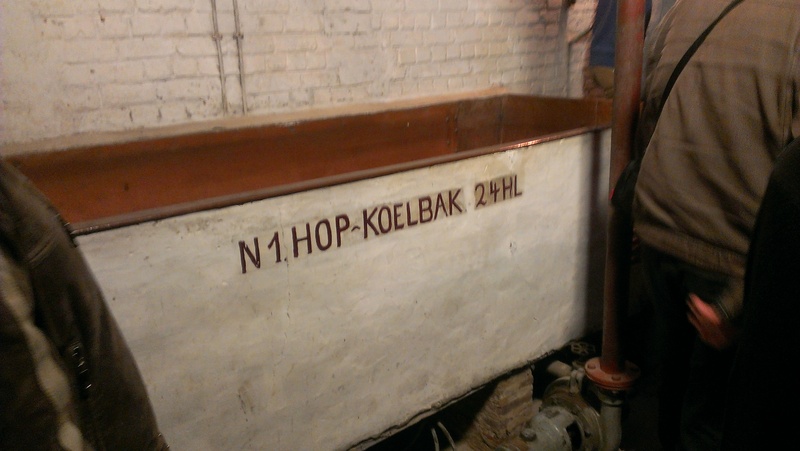 In fact, they are one of the smallest “breweries” on the tour, as evidenced by their coolship, which resembles a very large bathtub. Oud Beersel is known for their mild lambic, which we enjoyed as we took a guided tour through their gueuze museum. 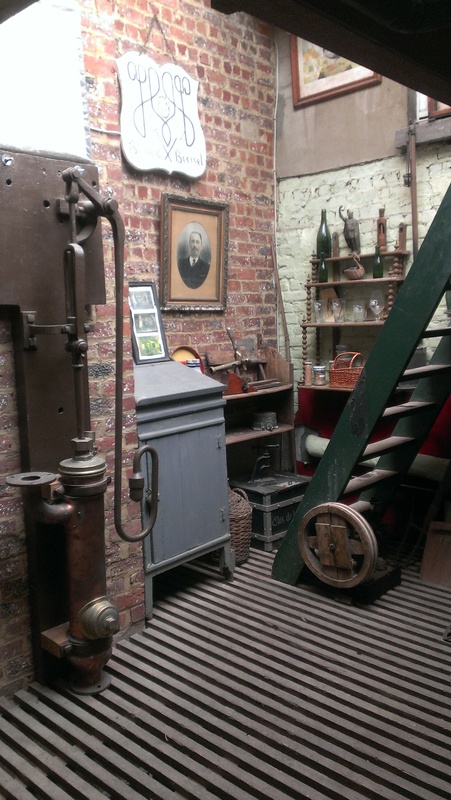 This little museum was quite spectacular, with lots of examples of old machinery, diagrams of traditional brewing practices, and even a couple of small rooms set up to resemble parts of the brewery in days gone by. Like any good museum, the tour ended in the gift shop. There, Theo bought us shirts before we headed outside to enjoy Oud Beersel sponsored festivities across the street, which included a marching band, a bagpipe band, and a whole pig being roasted on a spit. We arrived at Boon a little before 2:00 pm and were given an hour to return to the bus, which I think was not really long enough. Boon is a large brewery and there were a LOT of people there, making it a much more raucous affair than the breweries we had visited earlier in the day. After standing in line for 10 or 15 minutes, we were able to take a tour of the facilities, which included plenty of large volume stainless steel mash kettles, lauter tuns, fermenters, and other types of tanks as well as a fancy bottling machine. 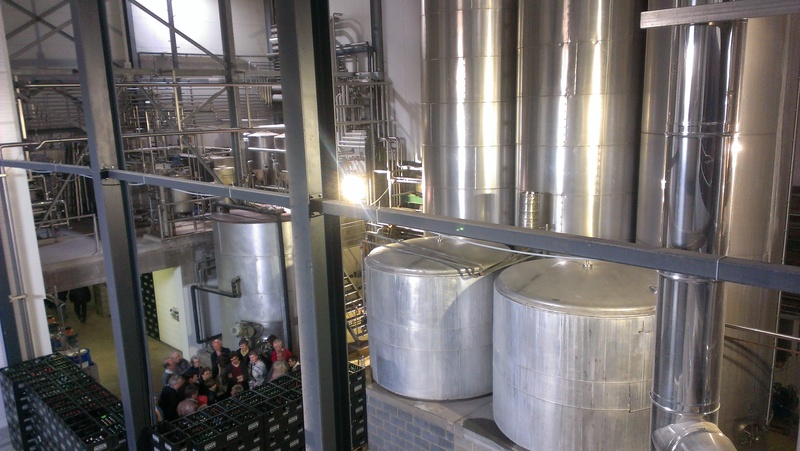 The Boon brewery also hosted the largest barrels of any brewery on the tour. These positively enormous casks appeared to be around 10 feet in diameter and each brandished a label with its numerical identifier. After the tour, we had a few moments to enjoy some beer in the tented beer garden on the premises. 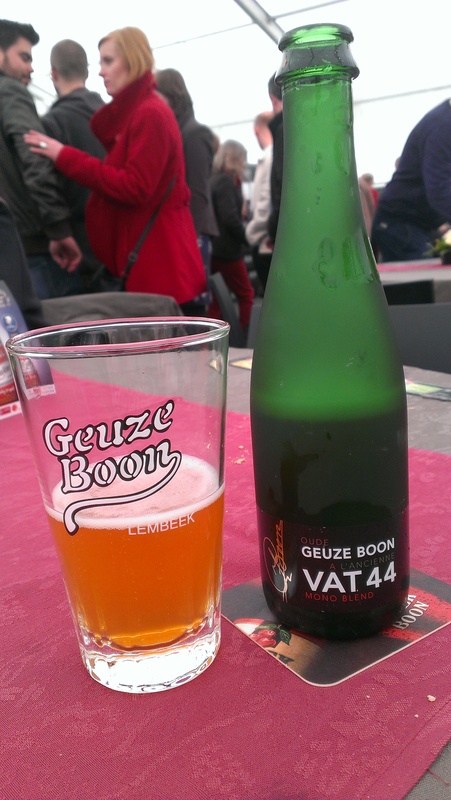 We had a 3 year old straight lambic to start, followed by Boon’s Vat 44 “mono blend” (90% from “Big Barrel No. 44”). Vat 44 was brewed on December 3-4, 2008, and fermented in cask No. 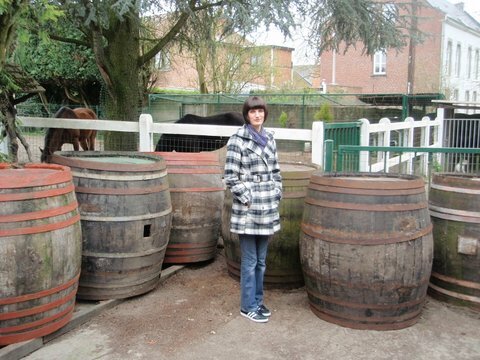 44, an oak barrel of 10,300 liter capacity that is over 100 years old. On August 31, 2010, Boon bottled 20,522 bottles of this brew. Vat 44 smelled of brett and dust, but also a bit fruity and sweet. The taste, however, was quite dry and tart with a short finish and a bitter end note. It’s light mouthfeel made it an easy drinker despite the 8.5% ABV rating. It was good enough that we grabbed a few bottles from the store on our way back to the tour bus. I like Boon lambics myself but Aschwin doesn’t quite appreciate the bitter notes in them. Our last stop of the tour was at the rather new business of Gueuzerie Tilquin. Located in Bierghes, in the Senne valley,Tilquin is the only gueuze blendery in the Walloon region. 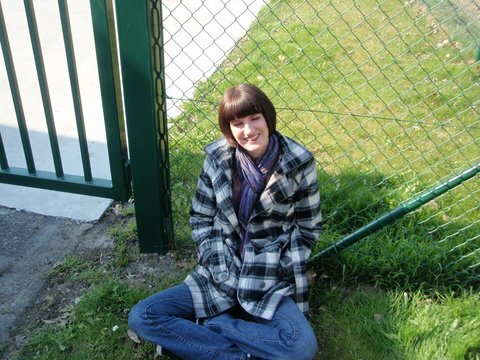 Since we were no longer in Flanders, this was also the only French-speaking gueuze site we visited that day. Tilquin, like Oud Beersel, is a blendery. 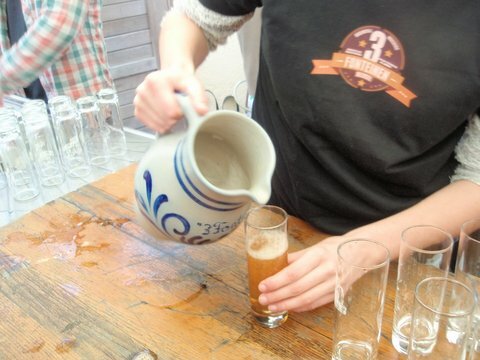 In 2009, they started purchasing freshly brewed lambic from various producers (including Cantillon!) and putting into old oak barrels they had acquired for fermentation for 1, 2, or 3 years. The lambics are then blended and bottled to produce their signature brew, the Gueuze Tilquin à L’Ancienne. The tour for this small facility was actually rather long, and we wound up having to cut out of it early in order to make it back to the bus before it left us behind altogether. 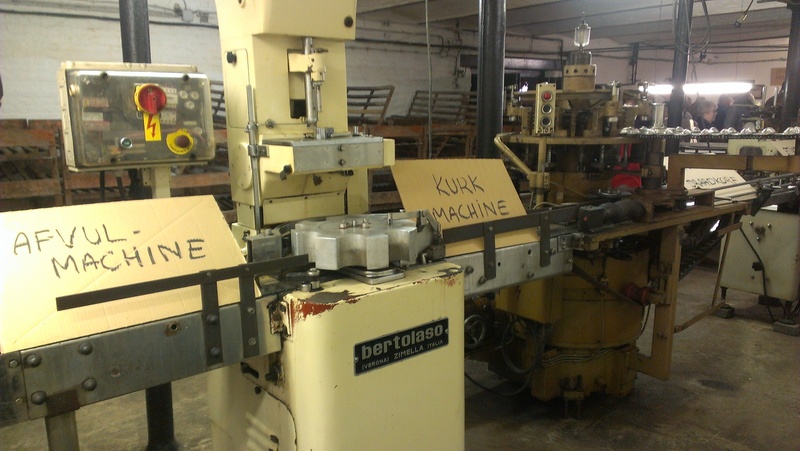 But the staff seemed very enthusiastic and knowledgeable. They’ve even begun making a beer from the spontaneous fermentation of destoned fresh purple plums (The Questsche Tilquin à l’ancienne). We did not have time to try it, but it sounds really interesting! While we were at least smart enough to eat a few things here and there throughout the day, we really didn’t have any other liquids (like WATER) besides beer the whole day. I honestly don’t even recall water being offered at any of the breweries we visited, but perhaps I wasn’t paying close enough attention. And though it seems the Europeans were all perfectly okay with this beer-only approach, I noticed a dull headache just before the last brewery visit. I felt okay through the end of the tour, but as soon as we reached our car in the parking lot things took a turn for the worse. By the time we reached De Heeren van Liedekercke (which is known for its extensive vintage lambic and Orval menus) for dinner I was absolutely miserable. I am certain that this was the worst headache I have ever experienced in my entire life, as the pain was near-crippling. Before heading to the bathroom to writhe in pain in private for a few moments I asked Aschwin to order some WATER for me. Upon my return, I was chagrined to find sparkling water in my glass. Still, I was thirsty. So I drank it. Aschwin and Theo had ordered more beer (!!!) and were looking the menus over. I didn’t want anything – it all made my stomach turn. My head was throbbing. The common simile of a jackhammer on the skull would have been a royal understatement. I was increasingly sensitive to light, sound, and motion. Everything caused severe pain. I must have looked pretty bad at that point. Finally, Theo offered the keys to the car so I could go lie down. But moving around so much did something to the carbonated contents of my stomach…. When it was over I felt quite a bit better (though certainly not great) and was able to lie down and get some rest until Aschwin and Theo returned. Riding back to the hotel with my head in Aschwin’s lap I marveled at what had happened. Alright Toer de Gueuze, I’ve learned my lesson, but I’m not going to let it get me down. I’m bringing some water bottles with me next time. For a long time I have wanted to write a blog post on the (possible) health benefits of lambic beer. I am not sure if one could argue that lambic is healthy in terms of extending the average human lifespan (let alone the maximum human lifespan! ), not to mention the risk of alcoholism, but there are a number of aspects about traditional lambic beer that compare favorably to most other beer styles. 1. The most obvious characteristic of lambic beer is that it is the product of both yeast and bacterial fermentation. As a result, lambic beer is much more of a probiotic than most other beer styles and may contribute to healthy gut flora. In addition, if you believe that humans do best to adapt to a diet and lifestyle closer to our ancestors (such as adherents of the Paleo Diet), lambic beer is a more logical choice (or, at a minimum, the least harmful) than modern pasteurized and bacteria-deficient beers. 2. Another interesting characteristic of lambic beer is that it is typically fermented bone dry with little residual sugar (Cantillon beers are a good example). This does not make it an “ideal” drink for diabetes patients, but you can certainly do a lot worse by drinking beer styles that have a lot of residual sugars such as imperial stouts or barley wines. 3. Another interesting aspect about lambic beer is that is has relatively low amounts of hops. The phytoestrogens in hops have been identified as potent inhibitors of testosterone, which supposedly contributed to hops becoming dominant as the sole herb (at the exclusion of more, well, “sexually potent” herbs) among Protestant reformers. When we think of testosterone we usually tend to think of body builders and juvenile aggression but testosterone has a number of important physiological roles in the human body for both males and females. One interesting question is whether the tradition of contemporary lambic brewers to use oxidized hops makes a difference, too. 4. Lambic beers are typically lower in alcohol. Unless you are an American “wild ale” brewer who believes that “more is more,” or you are a lambic brewer named Boon, lambic beer usually has a modest alcohol percentage between 4.5% and 6%. Alcohol is a strong diuretic and, like hops, has been associated with lower testosterone levels, too. 5. A number of lambic brewers (yet again, Cantillon) lean strongly towards the use or organic ingredients and abhor the use of artificial ingredients or processes. Clearly, this post is not the final word on the health aspects of lambic beer and some of these benefits may need to be further qualified or may turn out to be non-existent or only applicable to certain populations, genders, and age groups. It should be obvious that almost everything that I have said here applies to traditional lambics, not the pasteurized, sweetened beers that, unfortunately, use the same name. It should be rather obvious, too, that most of what is said here also applies to many American “wild ales,” provided alcohol and hops are kept at reasonable levels and added fruit is allowed to ferment to dryness. Instead of thinking of lambic as a specific beer style we can also think of it as a framework to approach brewing in general. This opens up the possibility of reinventing many traditional beer styles and allowing elements of the lambic brewing process to play a role in these other kinds of beer. For example, the use of wild yeast to lower residual sugar in a beer or the addition of (wild) bacteria. One of the most curious publications in the history of lambic beer, and I suspect, the history of beer, is Hubert van Herreweghen’s ‘Geuze en Humanisme.’ Its full title translates to ‘Geuze and Humanism: presumptuous reflections on the excellence of the beer of Brussels and Brabant, and the people who drink it, embellished with illustrations by Maurits van Saune.’ In 1955 Leo van Hoorick asked Flemish poet Hubert van Herreweghen (1920) to speak about geuze and humanism for the Vlaamse Club in Brussels and the text was later by published and offered to the club members as a 1956 New Year’s present in an edition of 400 copies. Since its publication, Geuze en Humanisme had become something of a rarity and collectors’ item until it was reprinted in 2010 by the Belgium province of Vlaams Brabant and Uitgeverij P. on high quality paper with the original illustrations. The title Geuze en Humanisme sounds rather pretentious and in a sense it is because the author starts his lecture with reflections on the death of the Dutch humanist Desiderius Erasmus in Switzerland and his final longing for the countryside of Brabant. This permits van Herreweghen to praise the people of Brabant and, of course, the beer known as geuze. Van Herreweghen entertains a number of theories about the name ‘geuze’ before he dismisses them, including the curious theory that the word geuze refers to the Geuzen who opposed Spanish rule in the Netherlands the 16th century. These freedom fighters used to carry beer on their belts and induced a second fermentation as a result of the shaking of the beer while walking in the sun! More likely, he admits, is that the name refers to the politically classical liberal brewers who released the beer in bottles. Notwithstanding the secular origin of lambic beer, the author confesses that the taste of the beer is quite catholic in nature. Hubert van Herreweghen then resumes his treatment of geuze by characterizing the beer and its production. 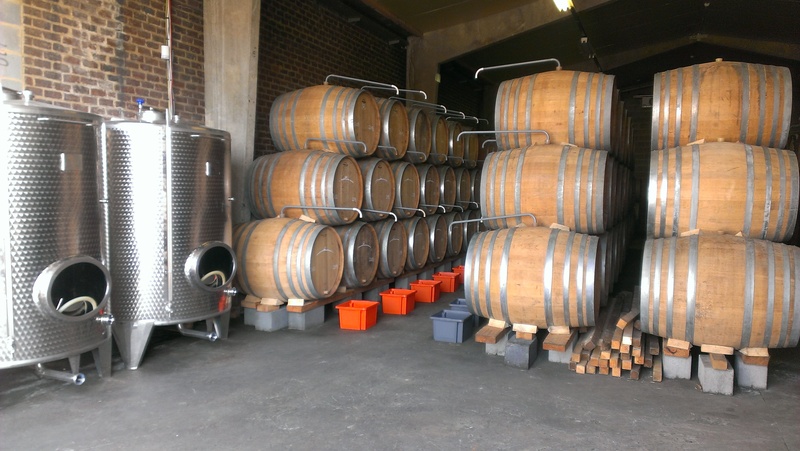 As do many historical writers on lambic, he emphasizes that the magic that spontaneous fermentation contributes to lambic is only possible in Brussels and its surrounding rural areas — and then only when brewing occurs during the winter months. We do now know that this is not entirely correct and this view has been replaced by the more modest perspective that spontaneous fermentation expresses the regional microflora and the Brussels area is quite favorable for the production of lambic. Without being too technical and boring to his audience, the author attempts to relay the microbiology that gives rise to lambic and concludes by observing that the production of lambic with all its (micro) struggles and uncertainties is like life itself. He also alludes to the subtle (regional) changes between various lambic brewers and the corresponding preferences and loyalties this phenomenon produces. The most memorable part of the lecture is where he discusses the health benefits of lambic, part sincere, part ironic. He start this topic by pointing out that geuze is not a drink of alcoholics but a beer meant to be consumed at home with family or to socialize with friends. We also know about the old doctor’s recipe of blending two eggs and geuze to create a medical potion to stimulate healthy blood cells – one of the illustrations features this concoction sitting on a nightstand. Outright hilarious is his description of a seriously ill farmer (Baldus) who was brought to the hospital for surgery. But upon opening the man the surgeons conclude that there is little hope for recovery and sent him home to die among his family. When the agonal farmer is asked if there is still something he wants he answers…”lambiek,” which is honored. After giving the dying man a young lambic the light slowly returns in his eyes. This lambic treatment continues for days and now the man still walks around as the living proof of the healthy and healing nature of lambic beer. After this extensive introduction to the virtues of geuze, he invites the audience in attendance to drink geuze with him and celebrate the health of the lambic brewers in attendance. Testament to the health effects of geuze is that Hubert van Herreweghen is still alive at 92 years old and even revisited the topic of geuze again at a Flemish event in 2010!